Vermont is quickly becoming known as a destination for high quality brewing as breweries of various sizes continue to spring up across the landscape. One of the latest is Ten Bends Beer in Hyde Park. Owned and operated by Michael Scarlata and Jason Powell, the 590 East Main Street brewhouse and tasting room recently started serving its craft brewed creations from its 3bbl system, but not before seeking assistance from Vermont Small Business Development Center (VtBSDC) Area Advisor and craft brewing specialist Charley Ininger. In addition to being one of VtSBDC’s area advisors, Ininger is also part of the specialty services VtSBDC has to offer. 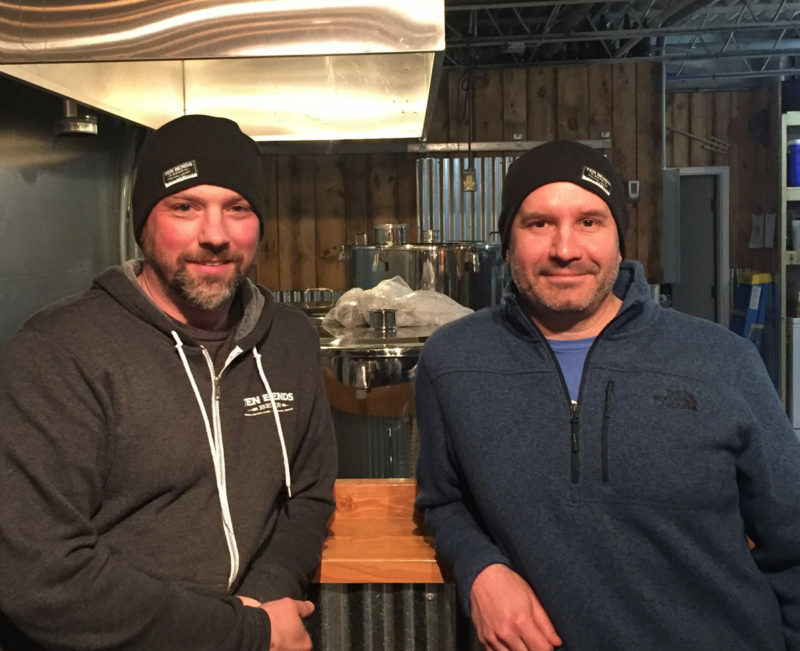 With many years in the food and beverage business and a keen understanding of what it takes to make a brewery a success from concept to creation, Ininger has worked with many Vermont beer makers as the brewing boom continues to expand. In addition to individual advice and advising, Charley offers a class in the business of brewing, a workshop he has delivered across the country. Scarlata said he and Powell attended one of Ininger’s brewing workshops as they looked to turn a one-time hobby into a full-fledged business. “Jason (Powell) and I had a strong desire to own our own business before we even met,” Scarlata said. “Being our own bosses and starting a company from the ground up in an industry we were passionate about was vital to our cause,” he said. The pair quickly went to work with Ininger on every aspect of the brewing business, including accounting, inventory management, sales, product development and marketing, among other things. “It’s a lot of hats to wear and very time consuming,” Scarlata said. “Charley gave us the tools to put together a professional set of financial projections. These projections were vital to us raising private equity to fund our business. Charley helped us focus our efforts and really got us to define a specific path of execution for launching our brewery, he said. For more information about Ten Bends Beer visit www.tenbendsbeer.com and for more about VtSBDC and the services provided by area advisors check out www.vtsbdc.org.